In 1964 BCIT opened it’s doors with two Health programs; Medical Radiology and Medical Laboratory for a total of 73 students enrolled. BCIT shared training responsibility with various designated hospitals. On successful completion, the student was awarded a certificate. These include degree and post-degree programs as well as the entry-level programs. The School of Health Sciences maintains the quality and relevance of its health training programs through close liaison with employers and professional associations. Maintaining the traditions of BCIT there are Advisory committees for each program. Students can expect provincial, national and international accreditation; regular external and internal program assessments; a variety of professional development provisions for faculty and staff; and integration of a variety of learning strategies, including industrial experience through projects and practicums. 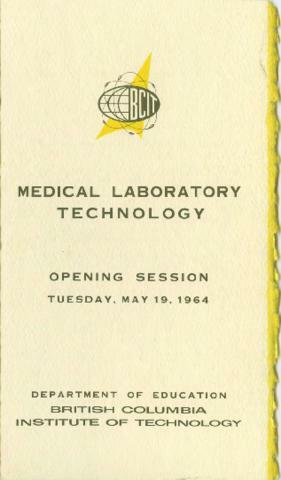 Commencement program for the May 19, 1964 Opening Session of the Medical Laboratory Technology, which was the first intake at BCIT.